After a rainy and stormy Thursday, the Baton Rouge area can look forward to improved weather Friday and beyond. Outdoor plans are in fine shape for Easter Sunday. Today and Tonight: Heavy rain and gusty thunderstorms will be possible through early afternoon. 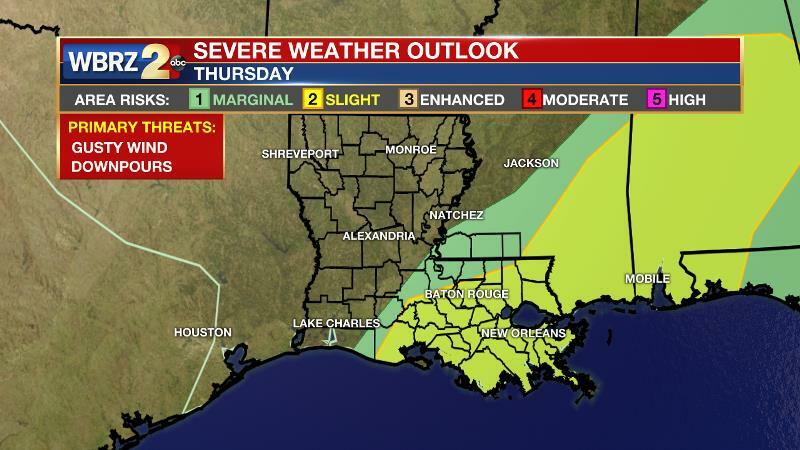 The Storm Prediction Center has highlighted a “slight risk” of severe weather for areas from Baton Rouge and points to the south and east. Damaging wind gusts and an isolated tornado will be possible. Not a bad idea to tie down any loose objects outside before storms arrive. Since it is the spring severe weather season, review your plans and keep devices nearby that can provide watches and warnings. These messages and updates can be found on News 2, wbrz.com, and the WBRZ WX App. on Apple and Android devices. 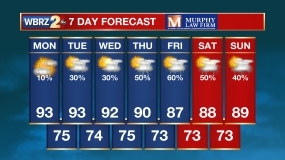 Follow WBRZ Weather on Facebook and Twitter for even more weather updates while you are on the go. Additionally, storms could leave behind an inch or two of rain, which will fall heavily at times. If you encounter a flooded roads, find an alternate route so you don't risk stalling out or being stranded. Relatively dry conditions leading up to this means area rivers are not expected to flood given the forecast amounts. Rain will push east during the afternoon hours, but high temperatures will not recover beyond the low 70s. Winds will begin to shift northwest overnight and as the air dries out, low temperatures will slip into the upper 50s. Up Next: While there may be some lingering cloud cover on Friday, the trend of clearing skies will continue setting up very pleasant weather for Easter Weekend. Saturday and Sunday will feature mostly clear skies, low humidity, highs in the mid 70s and lows in the mid 50s. A shortwave trough will move across the Mid-Mississippi River Valley on Thursday. The associated surface front will push through during the morning hours. The boundary will cause a period of heavy rain and thunderstorms. Baton Rouge and locations south and east of the city could experience strong storms with damaging wind gusts being the main threat. The Storm Prediction Center has outlined a 2 out of 5 “slight risk” for severe weather. 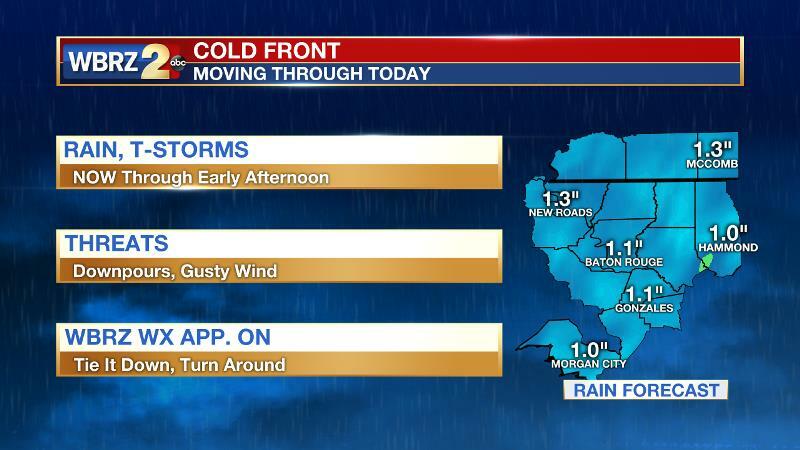 All across the WBRZ Weather Forecast Area, high precipitable water values will result in downpours out of most thunderstorms and up to two inches of rain may fall before the system pushes east. Usual nuisance flooding of poor drainage areas and roads can be expected in many areas. A relatively dry stretch of weather leading up to this event should mean that local rivers can handle runoff. A secondary front associated with the trough axis will move across the region Thursday night therefore holding some cloud cover in the forecast, which could even linger into Friday. However, cooler and drier air will advect into the region to end the week bringing very pleasant conditions for Easter Weekend. Models disagree over the next chance of rain, which could come as early as Monday or as late as Wednesday. Either way, that event does not look significant at this time.